Figure 4.8A. Performance envelope of six materials 5 feet (1.52 m) aft of the nose on a full-size operational vehicle. Figure 4.8B. Detail performance envelope for 1,700°F (927°C) and 2,100°F (1147°C) material. Table 4.3. Material selections and maximum lift loading boundary for Figure 4.8.
a These materials are hot isostatically pressed, rapid solidification rate (RSR) titanium powders and metal matrix composites (MMC) made from RSR titanium powder with either silicon carbide fiber or Tyranno fiber reinforcement. Tyranno fiber and coating are patented materials of the UBE Corporation, Tokyo, Japan. 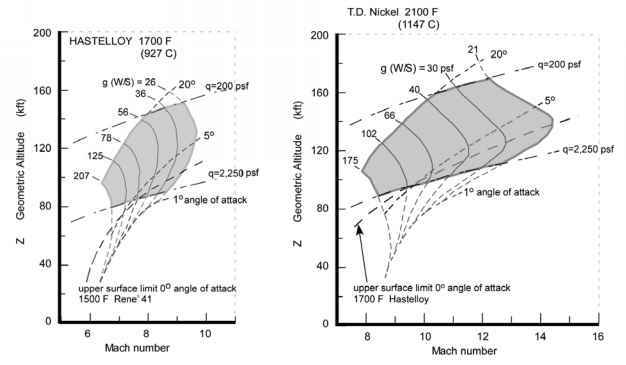 heat transfer rate and surface temperature determined at a point 5 ft aft of the nose were computed for the vehicles in Figure 3.11 as a function of Mach number, altitude, angle of attack and load factor, and are shown in Figures 4.8A and 4.8B. The load factor is the lift divided by the weight: in level flight it is exactly 1. In a maneuver such as a vertical turn, or horizontal turn, or change in flight path angle, the normal load factor can be in the 2 to 3 range. The normal load factor is defined as the ratio of lift to weight and is usually expressed in units of "g", the gravitational acceleration constant on ground (9.81 m/s2). The angle of attack range was selected from 1 to 20 degrees, since this class of hypersonic aircraft develops their maximum lift-to-drag ratio at less than 20 degrees. This range is not like the one planned for Space Shuttle or Dynasoar configurations, that typically have glide angles in the 40-to 45-degree range. The heating and lift performance was cross-correlated to arrive at a area plot of altitude versus Mach number for a particular material temperature, with load factor and angle of attack as parameters. Figure 4.8A shows the area plots for six representative radiation equilibrium temperatures [Anon., HyFAC, 1970]. Since 1970 the availability of materials has changed, so not all of the materials identified in the reference are available today. One notable example is thoria dispersed nickel (TD nickel). Thoria is mildly radioactive and what was thought acceptable in 1967 is no longer acceptable 40 years later. An equivalent material for 2100°F (1147°C) is the carbon/carbon and silicon carbide/silicon carbide metal matrix composites manufactured in the late 1980s by SEP at Bordeaux (which later became part of SNECMA, now SAFRAN-SNECMA). TD-nickel was not considered for either Copper Canyon or the National Aerospace Plane (NASP). So for a given material the operational envelope and maximum speed for an aircraft was determined as a function of angle of attack and load factor. As shown in Figure 4.8B each material forms an operational region bounded by four limits. The right-side limit is a minimum lift loading. This limit decreases as speed increases, because the aircraft becomes lighter as propellant is consumed and the aircraft accelerates toward orbital speed. Splan Splan where Splan is the wing planform area. The upper boundary of each area is 20 degrees angle of attack, and the lower boundary is 1 degree angle of attack. The left boundary is not the same for each temperature area, because the aircraft becomes heavier as less propellant is consumed to reach a lower speed. The materials associated with each surface temperature and the magnitude of the maximum lift loading for each is given in Table 4.3. Remember that the left and right boundaries are lift loads. If a maneuver of 3 "g" is required (and that is not impossible or unlikely for a hypersonic aircraft flying at high dynamic pressure) then the wing loadings corresponding to the minimum right lift loading is a maneuver lift loading three times the right minimum lift loading. In Figure 4.8B that corresponds to 63 psf at Mach 10, instead of 21 psf at Mach 14 for the 2100°F material, and to 78 psf at Mach 8, instead of 26 psf at Mach 10, for the 1700°F material. So if a margin for an emergency maneuver is the operational requirement, then the maximum speed must correspond to the emergency lift load, not the 1 "g" acceleration load. The importance of lift loading in determining the maximum speed for a given surface temperature is not to be minimized. If a vehicle is flying near its lift loading Mach limit, and for some reason the angle of attack, that is, the lift loading, must be changed, it may be mandatory to slow down before executing that maneuver. For an accelerating air-breather at 1500 lb/ft2 (7.32ton/m2) dynamic pressure, the 1 "g" level-flight lift loading can be doubled by a 2-degree change in angle of attack, a very significant effect. Near a speed boundary that could "over temperature", in pilot parlance, i.e., overheat, the compression surface (lower surface). Similarly a reduction of the angle of attack to near 1-degree angle of attack could "over temperature" the expansion surface (upper surface). For high-speed hypersonic flight it seems the straight and narrow is the best path. With either the hypersonic glider or the airbreathing hypersonic aircraft possessing a glide range approximately equal to the circumference of the Earth, it may be better to continue around and land at the launch site rather than attempting to turn back and overheat the structure. Scramjets accelerate by increasing their angle of attack to increase the inlet mass capture and therefore thrust. An afterburning turbofan engine can increase its thrust by 42% by advancing the power lever to the afterburner position: additional fuel is then injected into the afterburner downstream of the turbine. This maneuver increases thrust by burning the oxygen left in the exhaust gas flow, at the expense of increasing specific fuel consumption by 2.5 times (the 7sp is 40% of non-afterburning 7sp). Scramjets instead can easily double their thrust by an angle of attack increase of only a few degrees, at almost constant 7sp, by simply capturing more air flow. So while the afterburning turbofan in afterburner produces 1.42 times the thrust at 3.55 times the fuel flow, the scramjet produces 2.0 times the thrust at 2.1 times the fuel flow. So, when a pilot flying a scramjet-powered vehicle chooses to accelerate, when he/she advances the throttle the aircraft increases its angle of attack and accelerates! This can produce very different reactions in human pilots, not accustomed to see the angle of attack increase as the power lever is advanced. However, doing so can never give the automatic pilot any concern. 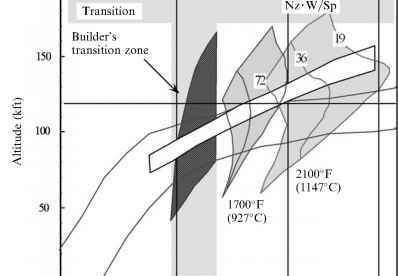 From Figure 3.16 for the hypersonic glider, the maximum compression-side wall temperature is 4600°F (2542°C). This means that any vehicle achieving orbital speed with a vehicle in the FDL-7 class of performance must have materials capable of the same thermal performance on its compression side, whether rocket- or airbreather-powered to orbital speed. In Figure 4.8 the maximum temperature material is 4600°F (2,542° C) for an airbreathing vehicle either cruising or accelerating to orbital speed. So a vehicle capable of orbital speed must be built of the right materials to potentially achieve airbreathing operation in the Mach 12 to 18 speed regime. Whether it is possible for the airbreather to operate in this range, considering what already said on the Second Law energy losses, remains to be seen. 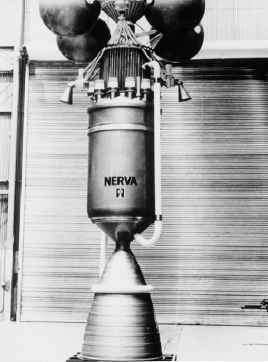 The P. Czysz and J. Vandenkerckhove collaboration early in 1984 established a practical maximum for operational airbreathing launchers [Czysz, 1992] at 3.9km/s (12,700 ft/ s) with the possibility to reach 14,000 ft/s (4.27 km/s) from a vehicle sizing, compression side materials, and minimum dry weight approach [Czysz, 1995]. Many vehicles may not require operations above Mach 12. TSTO launchers concepts usually "stage" (i.e., release the second stage) in the Mach 6 to Mach 10 range, although some concepts stage at Mach 12. Hypersonic cruise vehicles are historically in the Mach 8 to Mach 12 range because of the engine limitations, and also due to the very practical fact that flying faster does not improve the block time, because of the longer climb and descent time and distances. For these cases current titanium material systems match up well with the acceleration and cruise requirements. Figure 4.9. Materials and engine operating regimes compared. The ratio (Nz-W/Sp) is normal acceleration times wing loading in lb/ft2. will end in "over-temperaturing" the vehicle. This is one reason for automatic controls, because actions instinctive in subsonic or low supersonic aircraft are fatal in hypersonic aircraft. So whether accelerating or cruising, any deviation from straight-ahead can be a source of "over-temperaturing" the thermal protection system.